In the 1990s I was able to be far more avid a follower of Rugby Union than I am now. It was a great time for rugby, and every team had players one could admire and respect, even follow, without feeling a traitor to one’s own team (though in rugby it is more than OK to admire one’s opponents, which is part of the reason it is the game played in heaven. Don’t believe me – Google it!). South Africa’s team, the Springboks, was at the height of its powers back then, riding on the crest of the post-apartheid wave of hope that revived that nation. Its high point was winning the World Cup in 1995, which even inspired a Hollywood movie. One of the stars of the team was its scrum-half, Joost van der Westhuizen (a most delicious name on the tongue). Scrum-halves, with their companions fly-halves, tend to be the smallest players in a rugby team (though this is relative: international scrum- and fly-halves are all way bigger than me) but they tend also to be the fastest, the most skillful and very often the bravest. Joost typified the ideal scrum-half in his fearless tackling of the All Black colossus, Jonah Lomu. He was noted for his his physicality, and was one of the more marketable rugby stars. In time he retired and left the public gaze, at least the gaze of most foreigners like me. So it was a shock to read today that Joost is now nearing death, having been diagnosed 2 years ago with Motor Neurone disease. It is a truly awful affliction, a slow death in which the body shuts down leaving the mind largely intact and conscious of its plight. As a Jesuit novice way back in the late 1980s I spent time on a Jesuit parish in Adelaide, and on one day a week I was sent to the Julia Farr Centre, formerly called the Home for Incurables, Most of these days were spent on the motor neurone ward, and for a 20 year old it was a gut-wrenching experience to see people with no physical capacity but with sound mental capacity. I remember well the struggle not to seem patronizing to the patients, not to treat them like children or idiots, even when feeding them or cleaning them up. Joost in his prime (l) and this year (r). Joost, a Christian who, after some missteps in his life, has rediscovered his need of God, was interviewed with some friends earlier this year on South African TV about his motor neurone charity, J9. When it gets to the part when he talks the ravages of the disease become obvious (from about the 1:50 mark). A Christian should every day be praying for the sick and the dying, and the dead too (pace Protestants!). 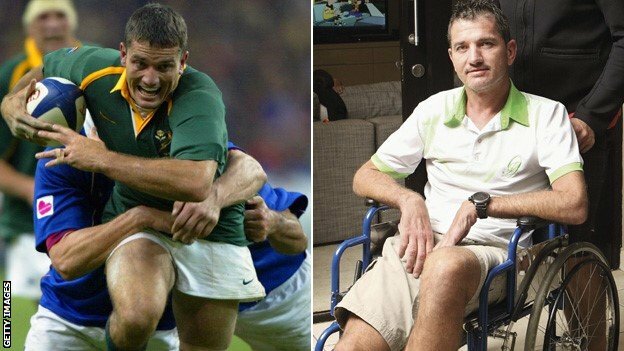 Perhaps today we might spare a particular prayer for sufferers of motor neurone disease like Joost. If this disease is not an experience of the Cross, what is? Let us pray too that Joost and other sufferers can bring themselves to unite their sufferings with those of Christ, and so prepare themselves for the glory of heaven that awaits them, and be for the rest of us means of both inspiration and sanctification, as their sufferings make up what is still needful in the sufferings of Christ (Col 1:24). 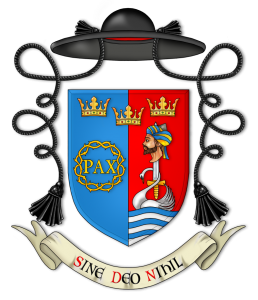 To see any sufferer of motor neurone disease is heart-wrenching, Yet there seems an extra perverse irony in someone who had been so physically strong and adept being reduced in such a way. It is so very, very sad. May the Lord be gracious and merciful to him. Thank you for this father. Closer to home for you, there was a very edifying article by an Australian Jesuit in the Tablet this week about his travails with MND and why he would not wish to artificially accelerate his death in spite of suffering. Thanks Hal. I tracked down that article you mentioned. 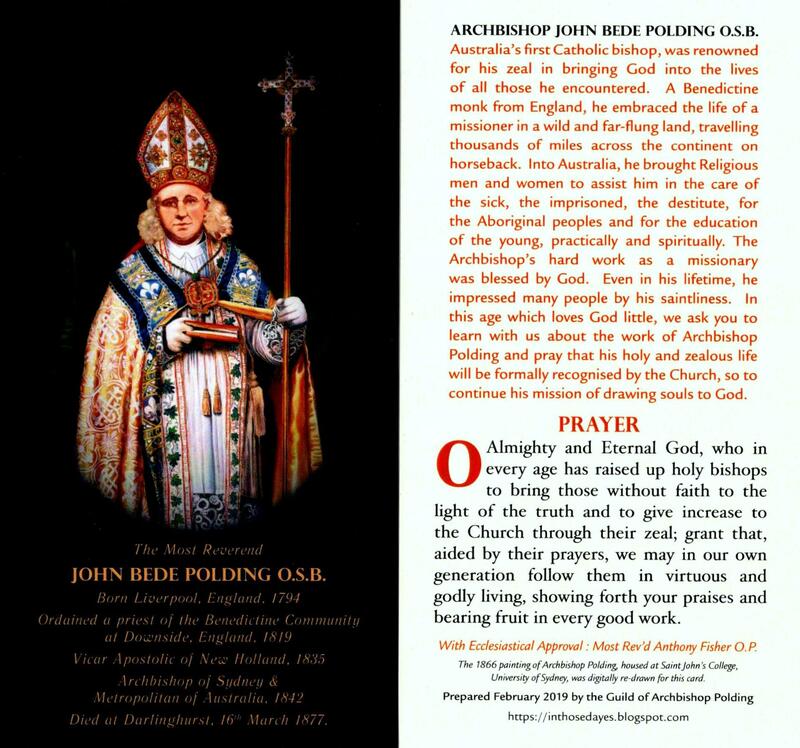 Fr King was one of the few Australian Jesuits I did not meet in my two-year stint with them. I pray that he has the resources, both mental and spiritual, to carry this terrible Cross now laid on his shoulders. I hope that many people would make it an advocacy to say a little prayer each day for those who are sick with any type of disease. That the Lord will give them strength to face whatever they are facing today and that He may give them healing. In fact I think it is our Christian duty to pray everyday for the sick; not just that they be healed, but also that their illness might bring blessing to them.